As I dive in to final preparations for my trip to Park City, Utah tomorrow, I'll just make a brief, hamster-related post. My research shows that my hamster blog entries garner the most comments. Go figure. While the dogs were all in their crates last night, allowing their flea medicine to dry, Ami and I spent some quality time together. He's a funny little rodent and true to his breed, just wants to escape and run free. 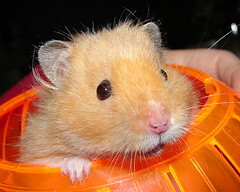 If you want to read some interesting hamster stories, there is a great blog post which links to BBC News Hamster Stories from 1998 to present. Ahhh, the cute. It burns! I hope we will be getting a Sundance report! Have fun. Ginger is working on a letter to Ami...maybe it will be ready for him to see by the time you get back...have a great trip!! Have a wonderful time, Jodi!